This is one of the best enhancements available today for the Apple on Top Hookah Bowl. 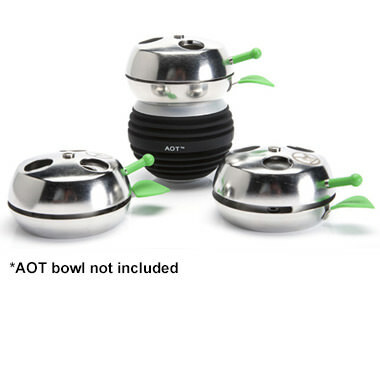 It works similarly to the Kaloud Lotus with all the same advantages, but is made to perfectly fit the Apple on Top bowl. The Provost is made from the highest quality stainless steel and is designed to withstand tremendous amounts of heat. It is recommended to use 3 or 4 hookah coals, preferably natural coconut coals if possible, but it handles well with Quick Lighting coals as well. The shape of the Provost allows for a super easy on and off when removing or applying the device to your shisha bowl. Much like the Kaloud, you have the option of opening or closing the air vents to let out or trap in as much heat as possible. Apple on Top Provost Heat Management System has a average rating of 0 stars out of 5 stars based on 0 reviews.